You can't shove an official. Simple as that. There is a generally understood rule that a football player should not, under any circumstances, put his hands on an official. 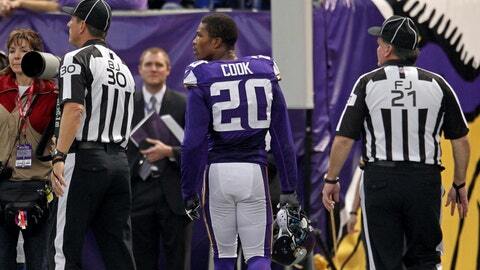 Vikings cornerback Chris Cook disregarded that edict on Sunday during Minnesota’s game against the Chicago Bears, and got himself ejected from the contest as a result. I’m not sure whether Cook was mad that he gave up the score (though, really, what more could he have done to prevent it?) or upset with the fact that it was ruled a good catch (which it was). Cook was hit with an unsportsmanlike conduct penalty, then tossed from the game, which the Vikings went on to win 23-20 in overtime — perhaps the only good news for Cook on the day. But even the victory is likely bittersweet, because later this week, Cook will almost certainly be hit with a $26,250 fine for getting handsy with Hayes.